Today’s traditional one-lap top-ten trial to sort out grid positions for the Suzuka Eight-Hours was abandoned and replaced with a 40-minute normal qualifying session due an impending typhoon. 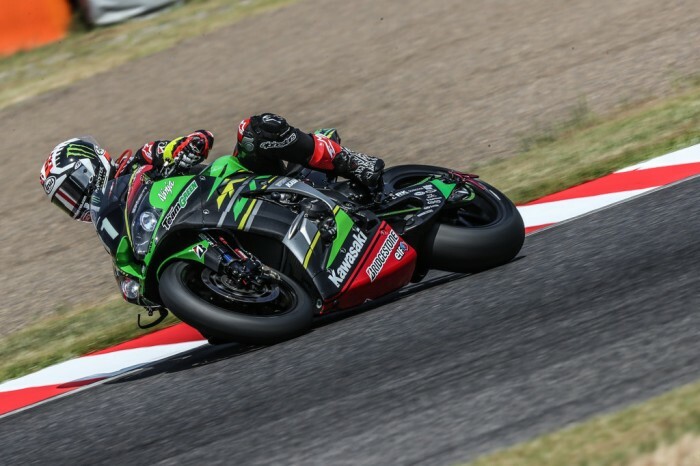 The changes had no effect on Jonathan Rea and the Kawasaki team who managed a 2’05.403 to lead the session by almost three-quarters of a second from Red Bull Honda with reigning champions Yamaha in third but only 0.043s behind. It is Kawasaki’s first pole position since 1995 when Anthony Gobert stuck his ZX7R on the number one spot. The MuSASHI Honda mob took fourth place but were very close to the top three, finishing just 0.007s and then there was a half-second gap back to Yoshimura Suzuki in fifth as they ended with a 2’06.642. Tommy Bridewell’s S-Pulse Dream Suzuki are in sixth with YART the fastest of the regular EWC teams in eighth. Former BSB star Ryuichi Kiyonari and his Moriwaki team are in ninth.